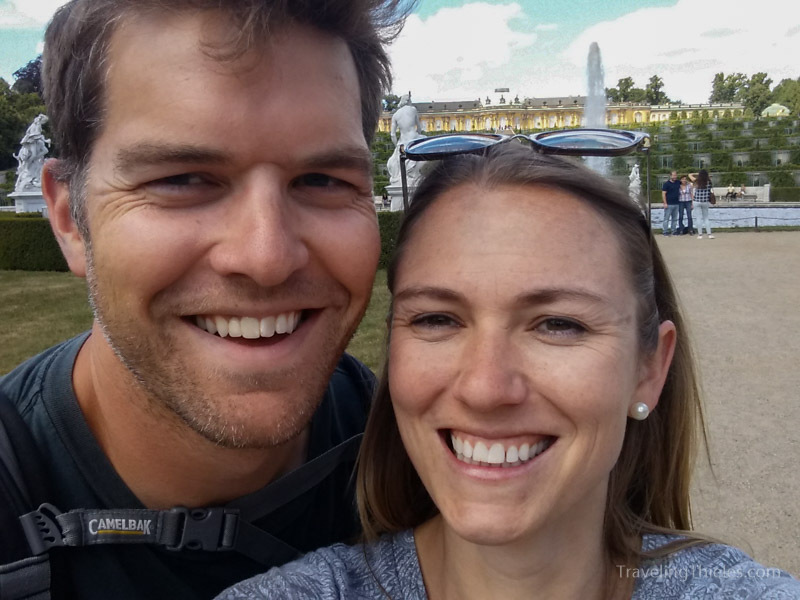 We have been hearing great things about Berlin for years, so our week-long visit at the end of our Spring 2016 Eurotrip was much anticipated. 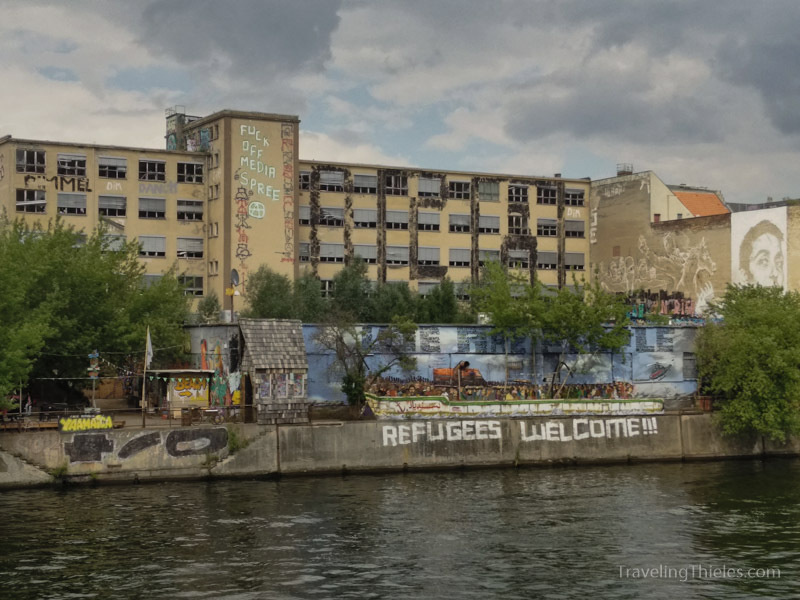 In general, frequent travelers seem to agree that Berlin is the most progressive, liberal, artistically enticing and affordable city in “western” Europe. Based on our stay, we would agree. 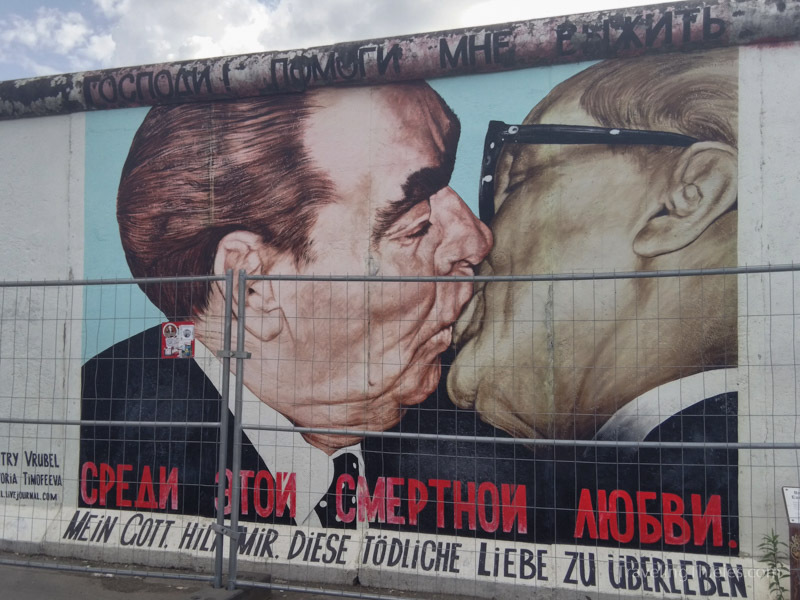 Berlin has a tragic history in the last century – ignominiously being the seat of a Nazi power during WWII, almost complete demolishing as a result of the war, slow redevelopment after the war and then half the population living in constant fear of the Stasi secret police during the Cold War. We stayed on the west side of the side near Kurfurstendamm strasse. Turns out this is the main shopping thoroughfare in the city which is where we normally try to avoid. However, the nights were all free using Club Carlson points, so we can’t complain too much! The city was turned into ruins as a result of WWII. 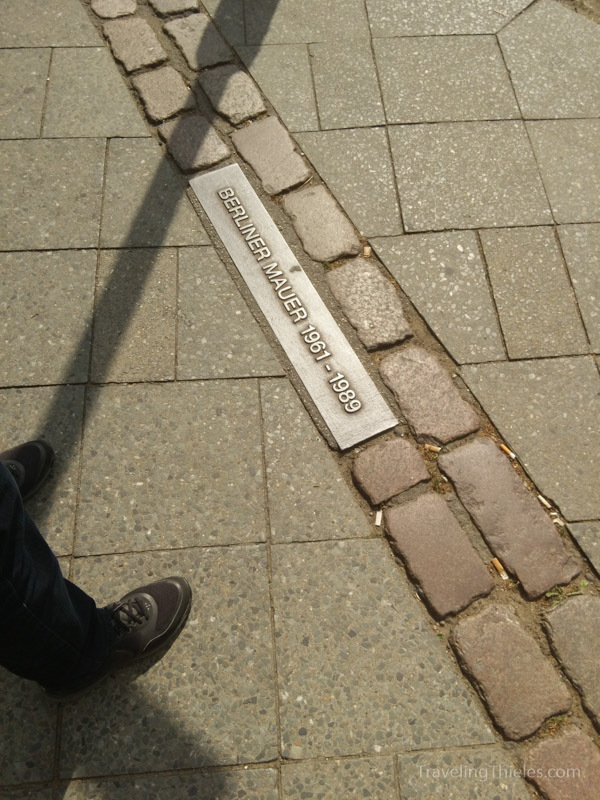 Unlike other cities in northern Germany which rebuilt relatively quickly, the ruins remained for many years particularly in the eastern part of the city where they were neglected during the Cold War. Apparently it has only been in the past decade or so that the buildings have been restored as waves of hipsters arrived. There were still some interesting relics of the past tragedies. This building was covered in vines. 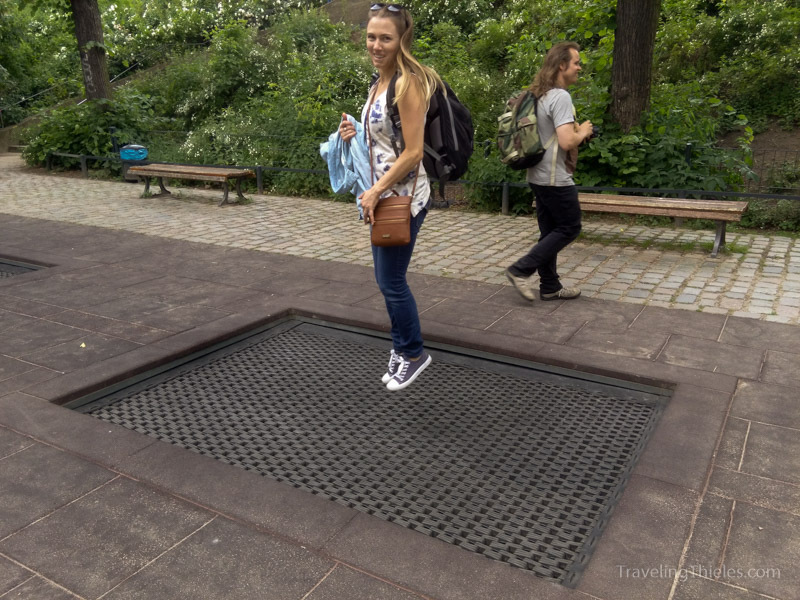 This park which was rebuilt after the war had a tramoline built into the sidewalk! Pretty unique. 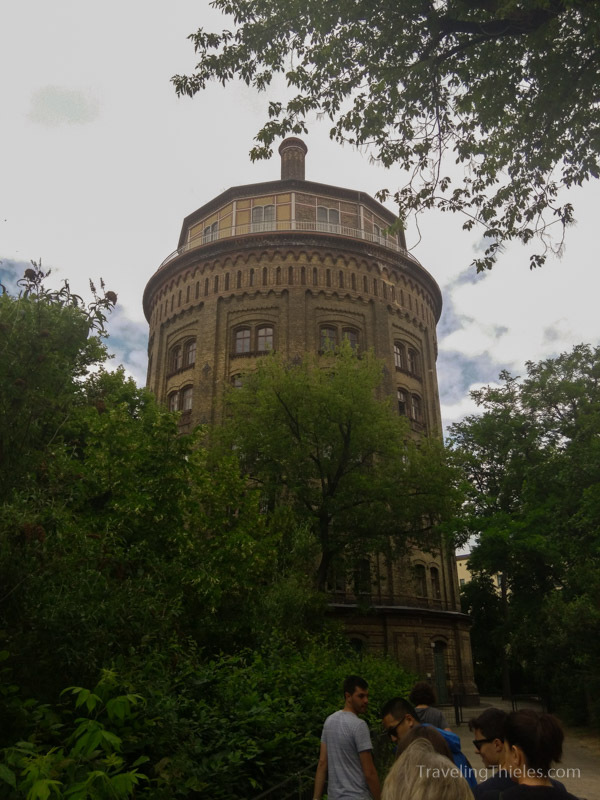 The building in the background began life as a water tower, was then converted into a prison used by the secret police, and is now some of the most desirable apartments in the area. 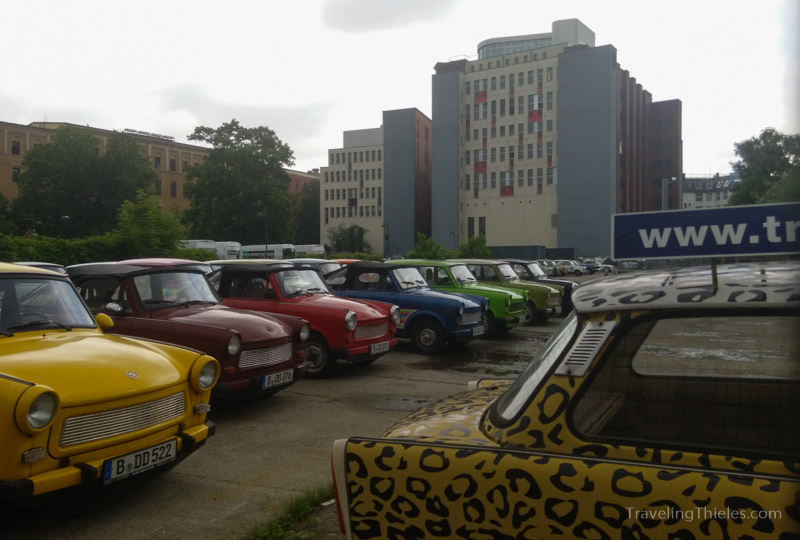 There are many Traube cars which were made by east Germany during the Cold War. 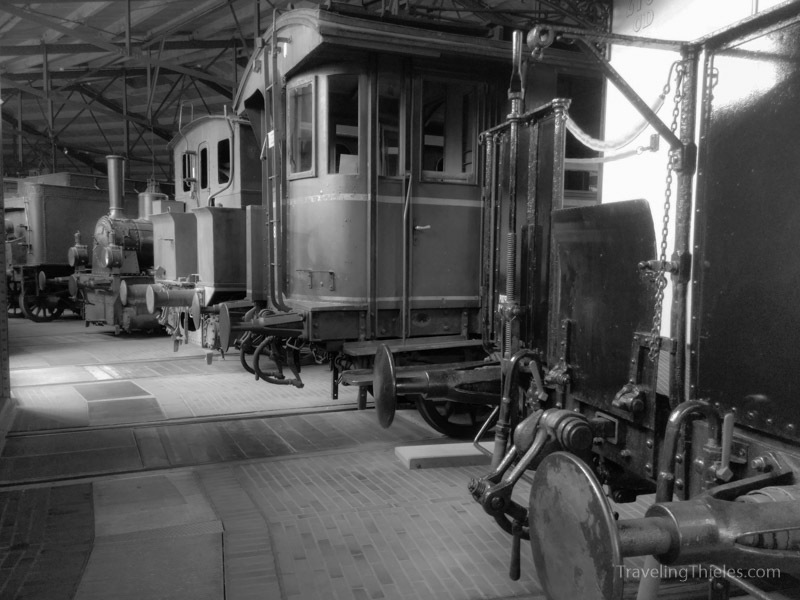 Some remain in use today and can be rented by tourists for a unique experience. During the years that Berlin was rebuilding, it became a people magnet because of the cheap cost of living. 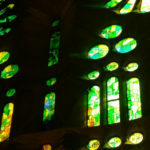 An artistic and alternative culture soon emerged. 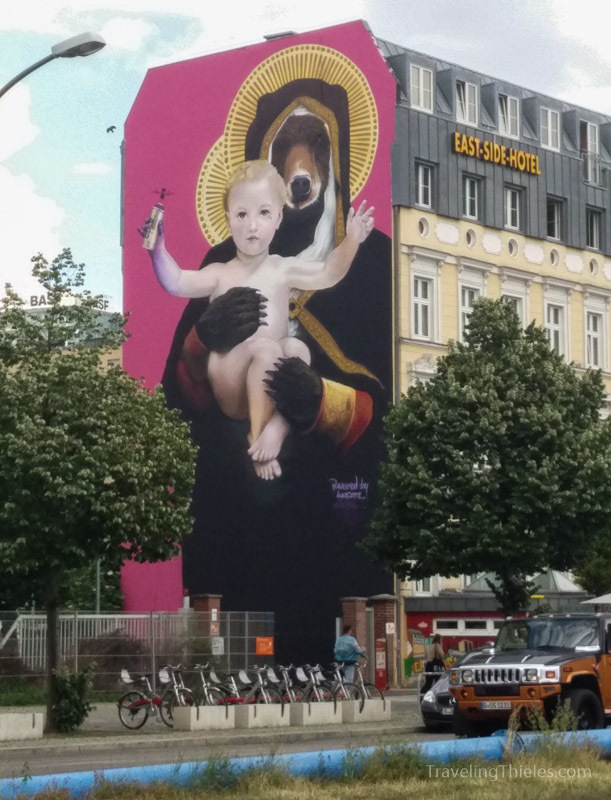 Now, Berlin is a considered one of the most creative and progressive cities in Europe. 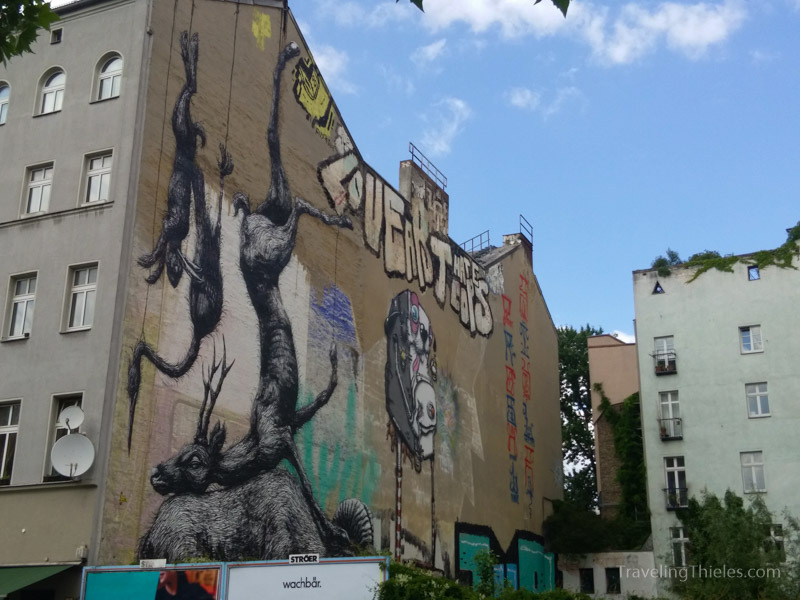 We would say that the graffiti (although not the tagging) which is literally everywhere is one of Berlin’s most apparent superlatives – there is no other city we have been to in the world with as much interesting street art. 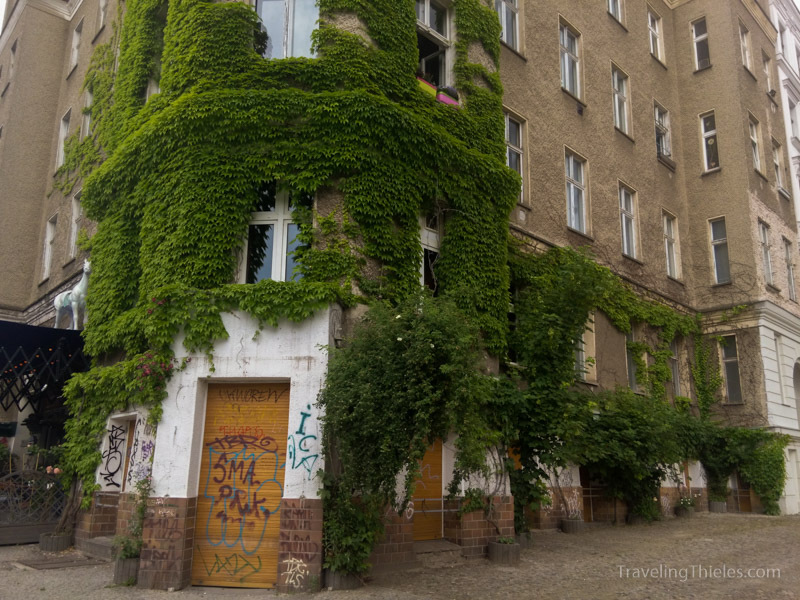 The ruins of the old city made most of Berlin an easy target for spray painting. 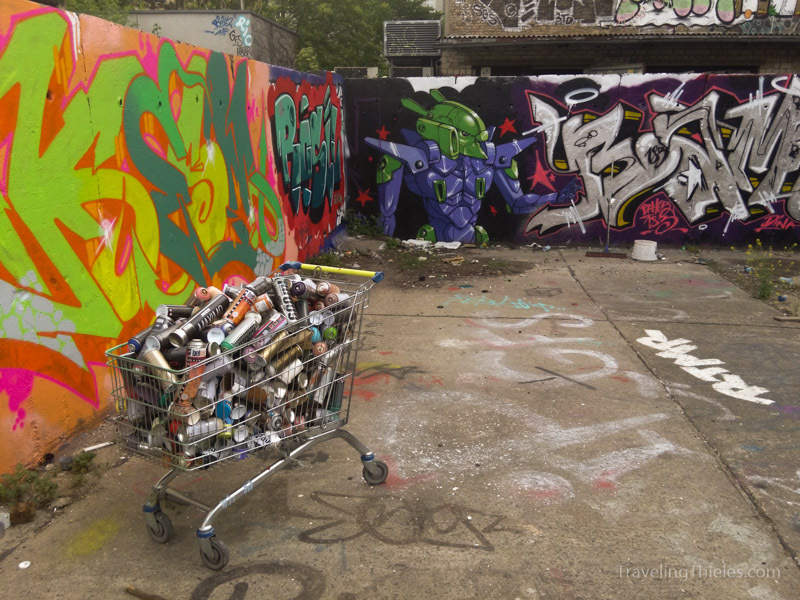 There are some alleys like this one which are known as graffiti practice parks. 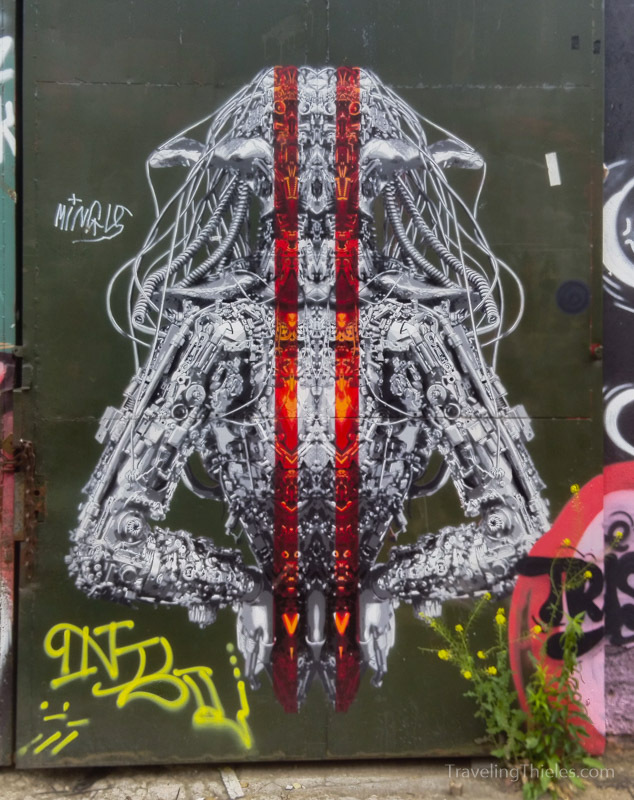 This piece entitled “Chernobyl” was particularly awesome and was made using numerous stencils to achieve the detailed shading and highlighting. This is probably the most famous piece. At night a large flag in front of a light which is in a lot adjacent casts a shadow on the image and makes it look like the astronaut is about to plant a flag. This was a commission piece, as many of the better graffiti works are now. Dead animals are a favorite subject of this artist. 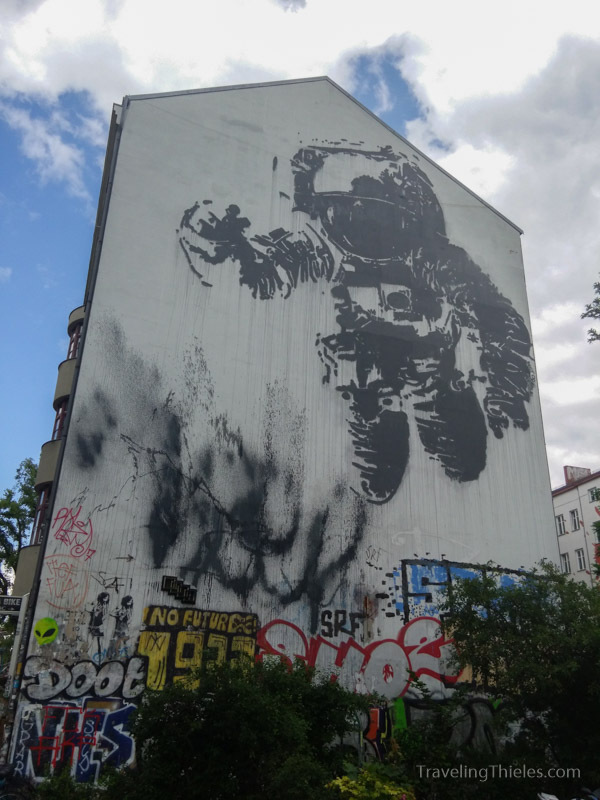 Graffiti and tagging is literally everywhere in Berlin. We went into this art space/museum and and the walls were covered. 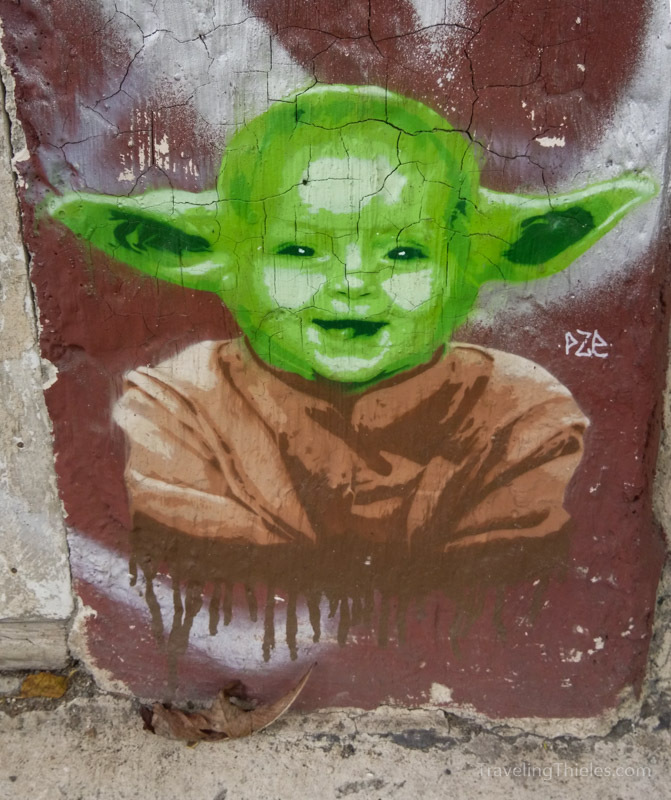 This is Mayne’s favorite – Yoda Baby. Awesome paintings at the entrance to the beach bar. 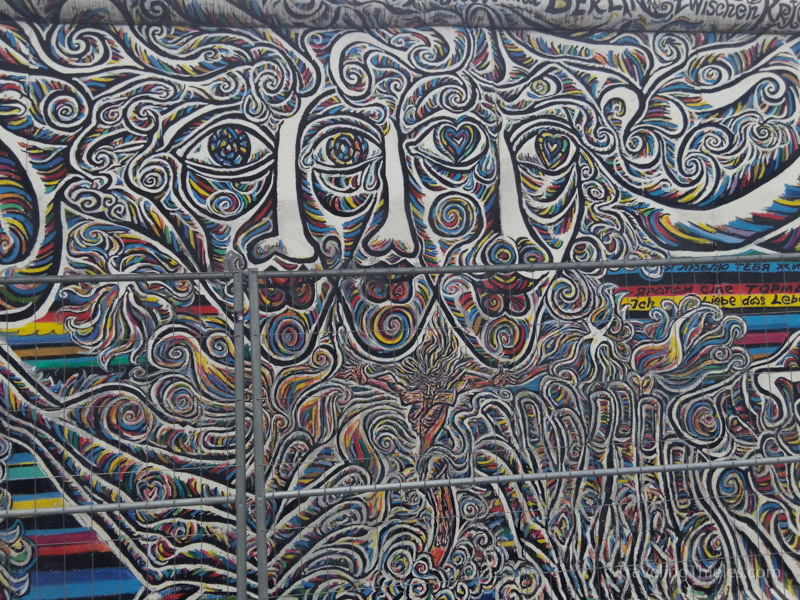 The remaining stretch of the berlin wall (aka Iron Curtain) has some of the most well-known graffiti in the city. 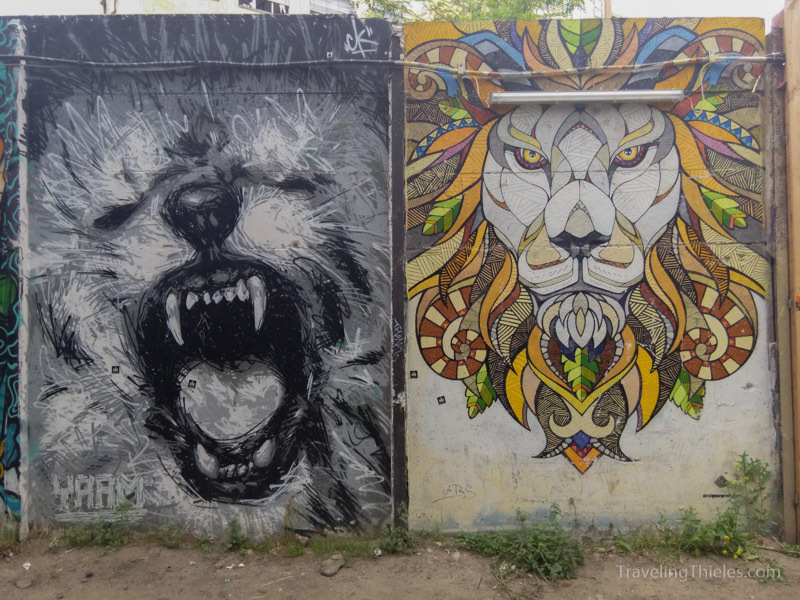 This detailed design stretched at least 20 or 30 yards along with the wall. 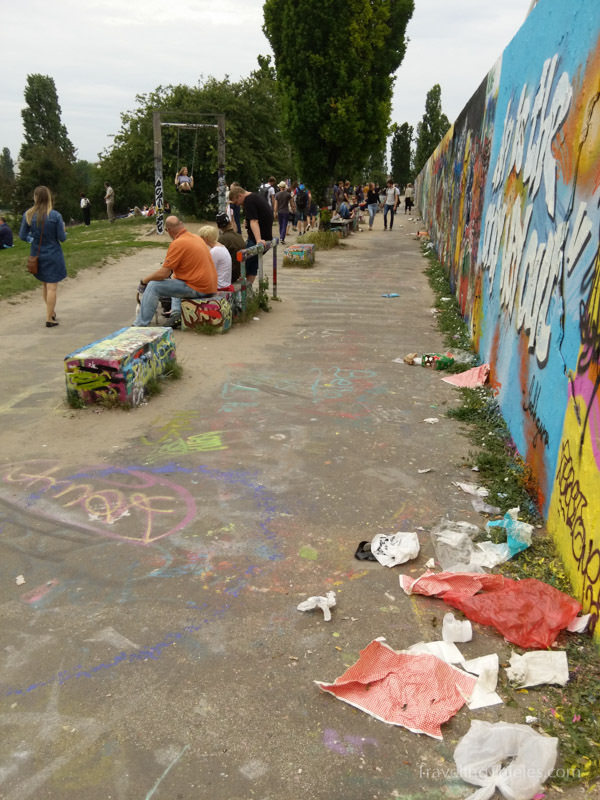 This is another practice wall along the border of the Volkspark. 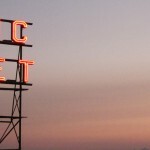 The alternative and artistic culture which emerged during and after the cold war has influenced the social and political policies/leanings of the city. To our eyes, the city truly seemed like a place where one could be whoever they wanted and act however (within the laws). This building is a squatters building. 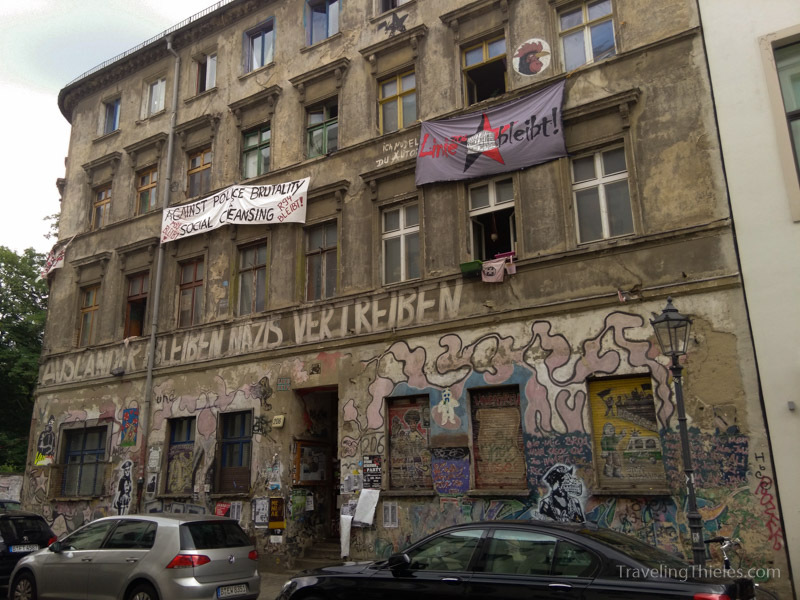 Historically, these buildings are holdovers from during the time of rebuilding, when the alternative culture in Berlin developed and squatters moved into the many abandoned buildings in the city. Communities among all these squatters emerged as free communes. Today, rather than to tear them down, the city has chosen to retain and help support these buildings and the resident communities. In many cases, the communities are helpful in providing community services and drug rehabilitation. They are also the center of political protests. There is usually at least one of these buildings in each neighborhood. 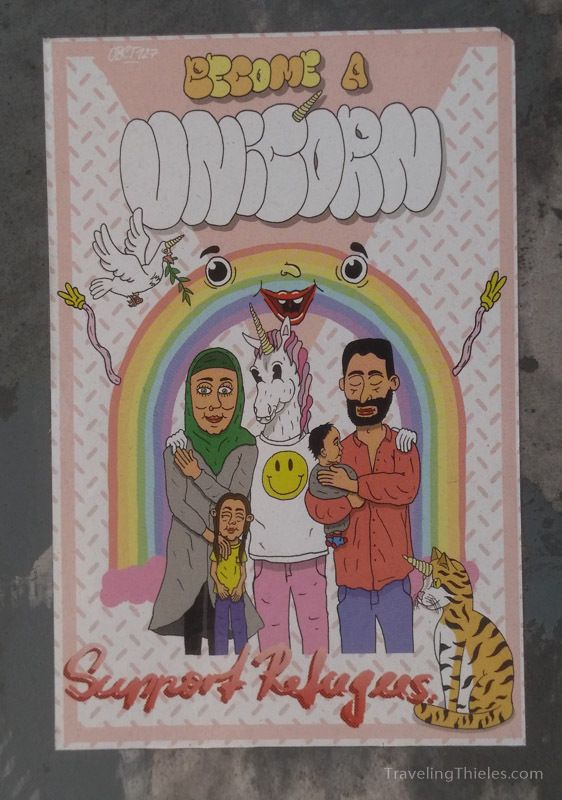 We saw many “support refugees” slogans throughout Europe on this trip, but this was the most creative. 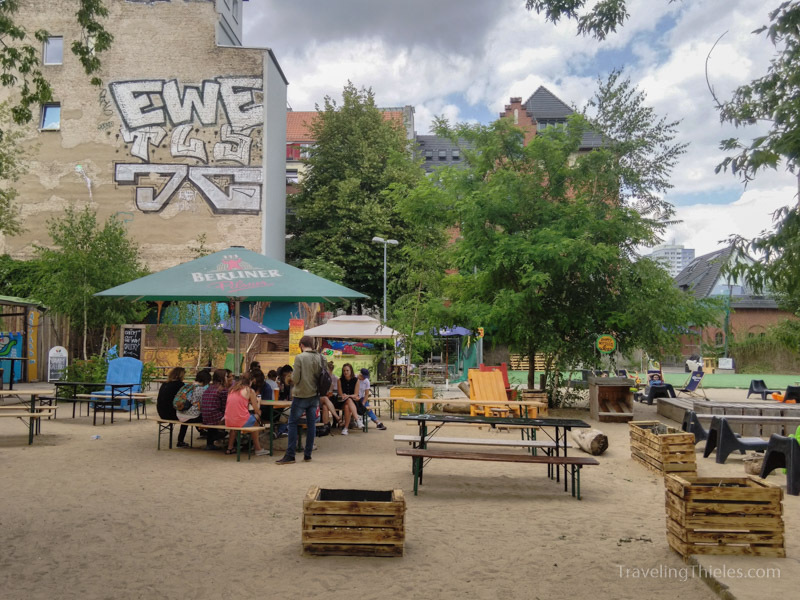 This once-abandoned stretch of the Spree river was turned into a very popular open-air bar (of course there are no laws in Berlin forbidding open alcohol containers), complete with a sand beach. It was recently moved from slightly further down the river where many corporate buildings have gone up. The opinion of the corporation Media Spree which built the new buildings is graffiti’d on the wall of the building behind. 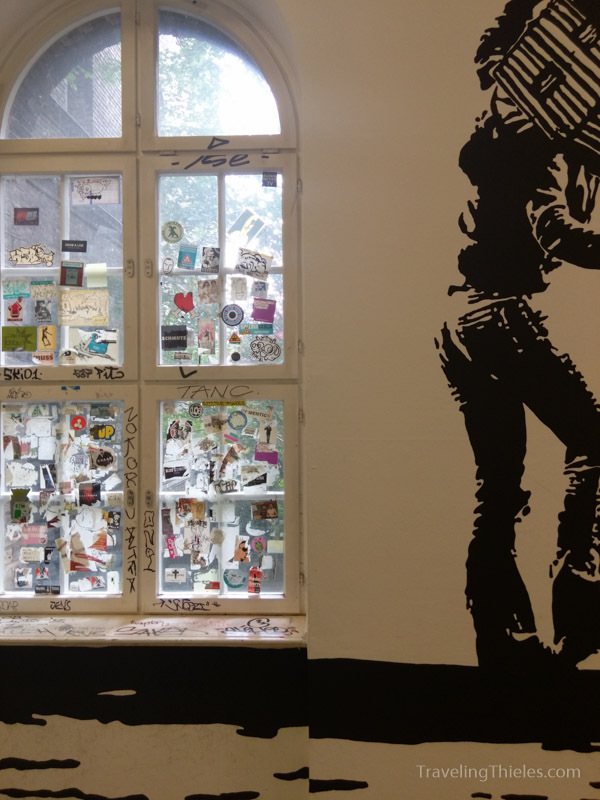 Berlin has some of the best flea markets we have seen anywhere in the world, and they went on throughout the week not just on the weekend. Each market seemed to have a different theme, be it antiques, clothing, brickabrack or handmade items. Our favorite was probably the one in Volkspark, where we found the best food options. We also found many neat art stores on our walks through the city. 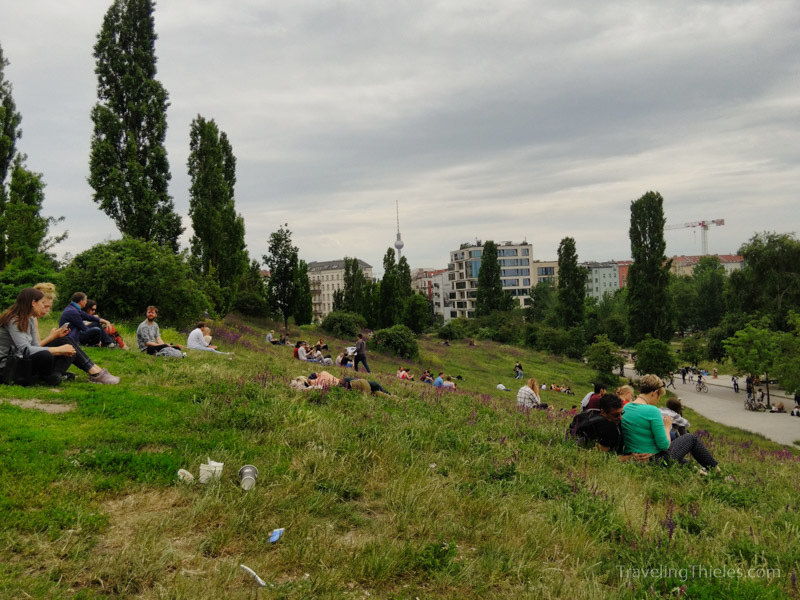 The hill on the east side of the Volkspark had many people taking a picnic and watching the activities below. Rather than mow, the city has let the vegetation grow and many wildflowers were also around though not pictured. 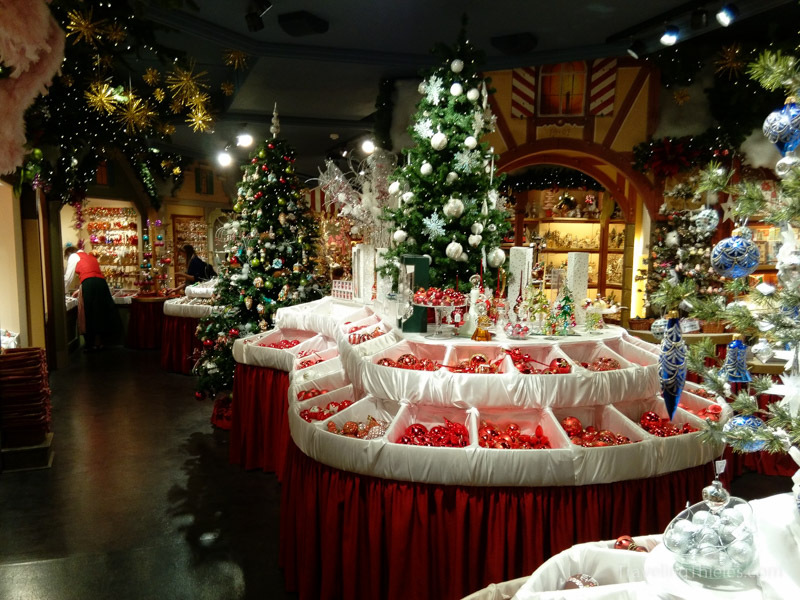 There was a Karl Wolfaurt Christmas store near our hotel that was pretty spectacular. 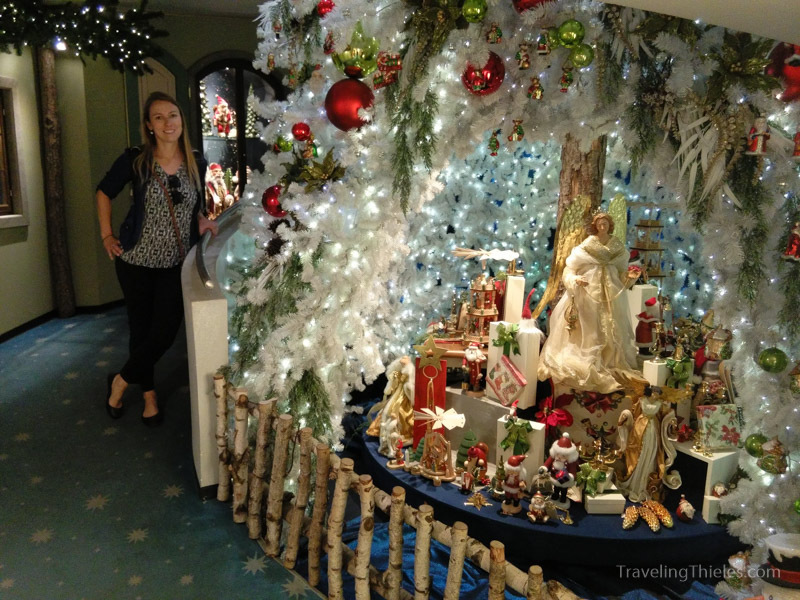 This is on the corkscrewing entrance ramp to the store with a big hollow Christmas tree in the center. 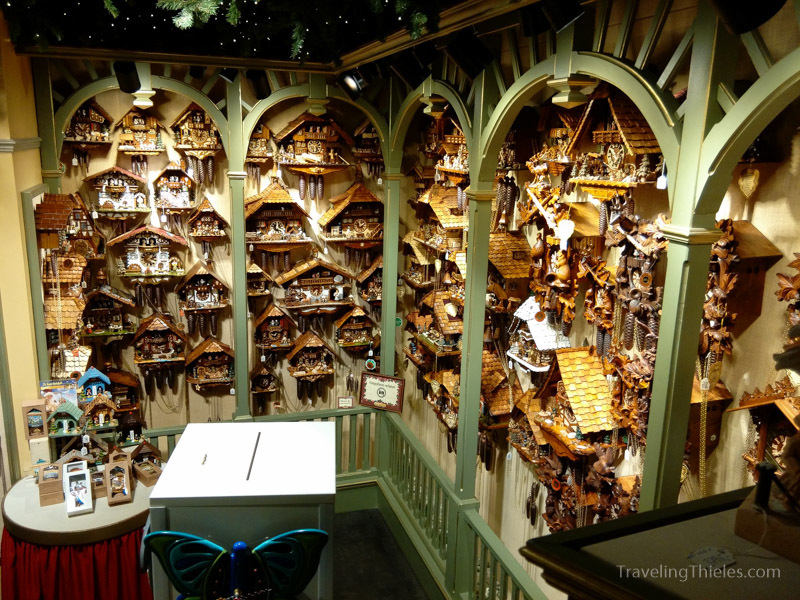 A selection of very cool cuckoo clocks. Unfortunately the cheapest ones were a couple hundred dollars..
We tried to eat “the highlights” of Germany while in Berlin, although we mainly stuck to the Bavarian specialties. We found the food in general to be about as affordable as in the US, with the quality as variable. 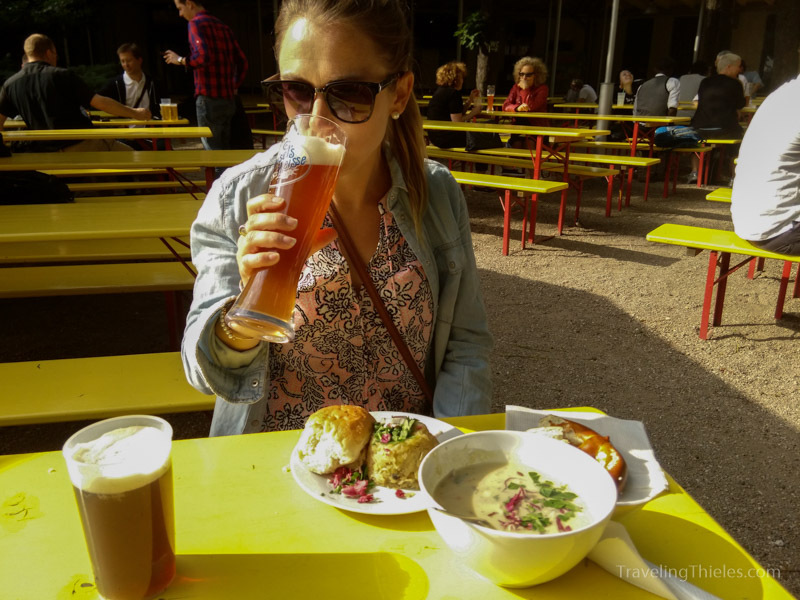 We particularly enjoyed the beer gardens, which are one of Germany’s best contributions to the world! As we mentioned in a couple of our previous posts, McDonalds has really stepped up their game in Europe. 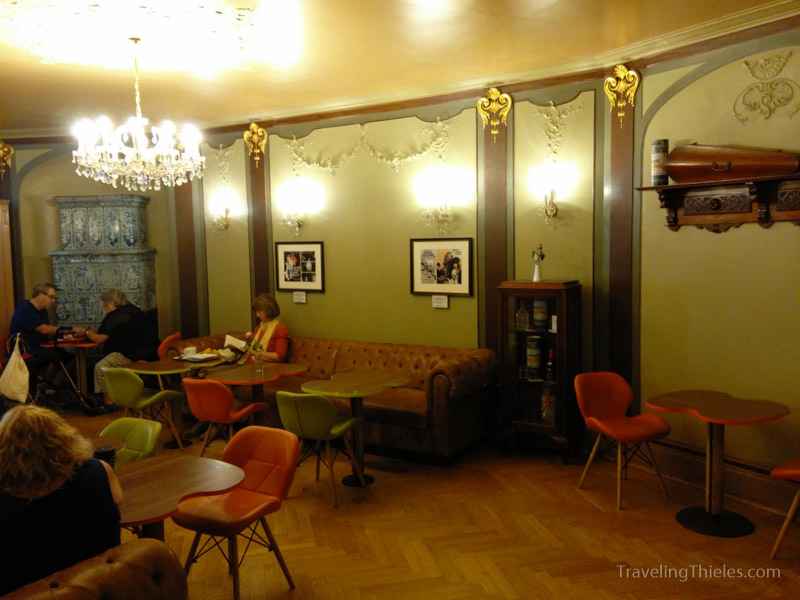 This was the dining room of the McDonalds on Kufurstendamm strasse near our hotel.. 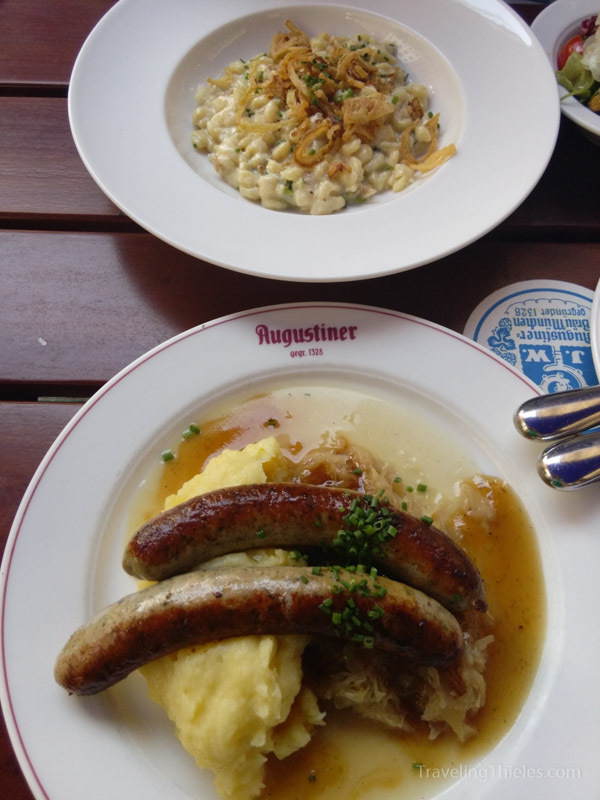 The Augustiner brauhaus was much anticipated by Mayne and did not disappoint. 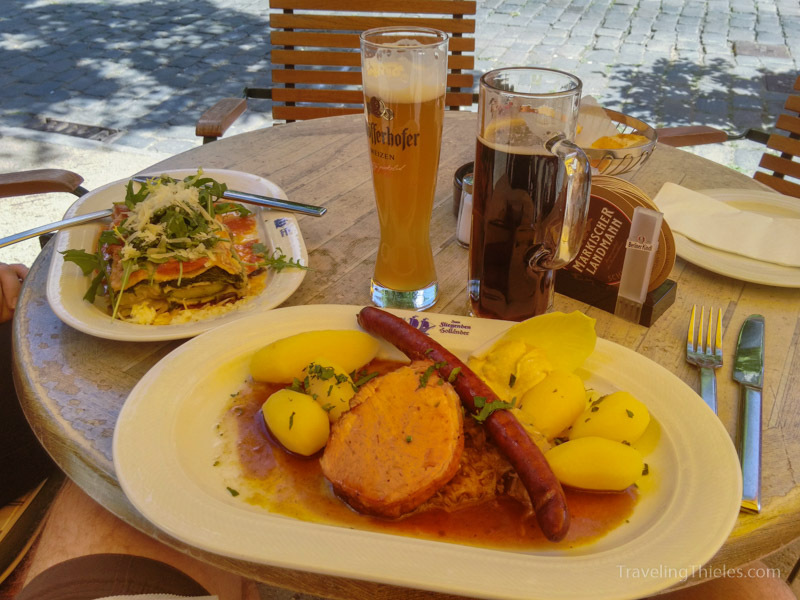 This is currywurst and spaetzle (a kind of potato dumpling pasta) – both delicious and perfectly paired with a German lager beer. At the Prater biergarten, the oldest one in the city and just one of the many beer gardens we visited. There is no waiter to pay and the food is usually of good quality. We loved the outdoor setting. 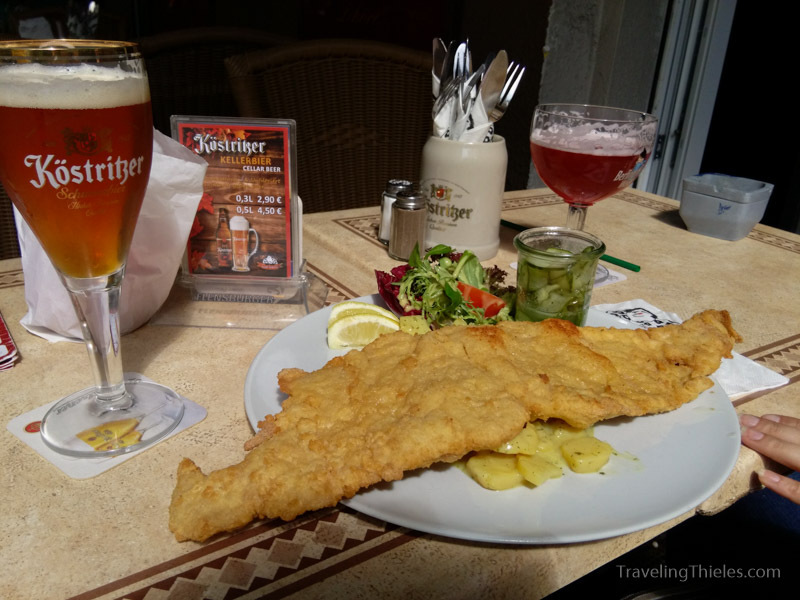 A tasty meal we had on our daytrip to Potsdam. Fantastic vegetable lasagna on the left and a sampler platter on right. We found these pickle shots at the grocery whhaaatt? It’s alcoholic pickle juice. They were kinda expensive so as much as Elisa loves pickles we didn’t try them. 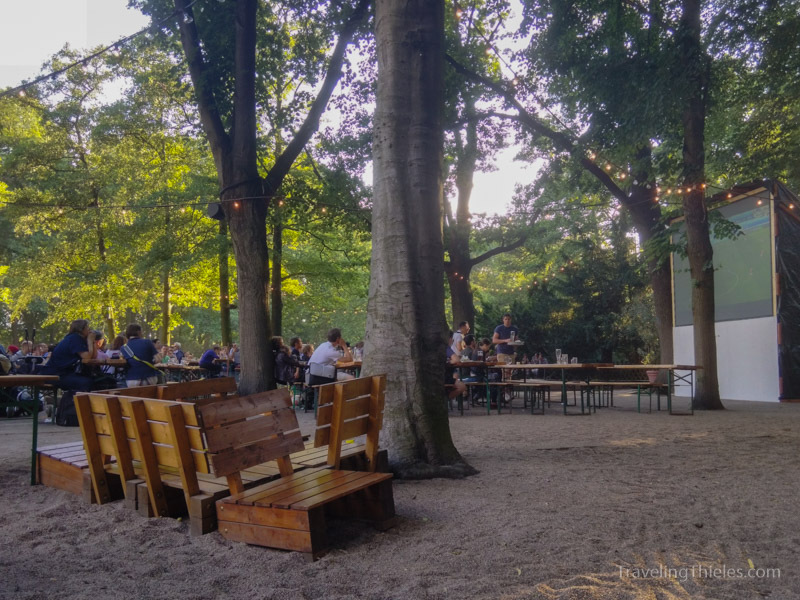 Another wonderful biergarten where we relaxed under the trees and had a couple tasty snacks. This one was in the Tiergarten – the central park of Berlin. 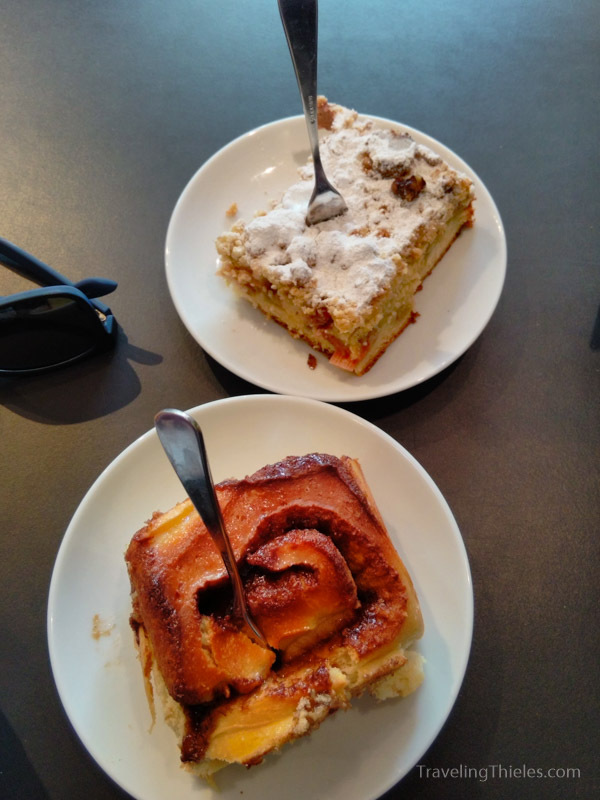 Fantastic cinnamon roll and berry tart at a bakery we found on Yelp. 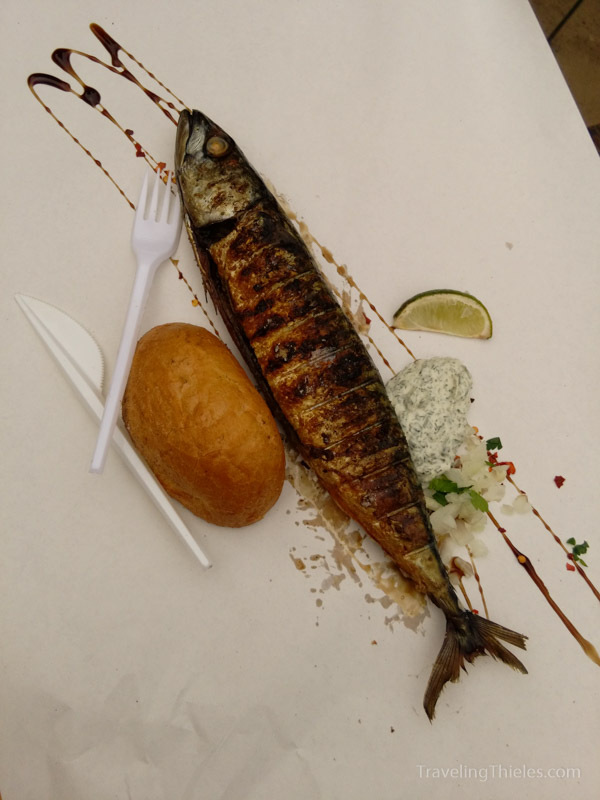 We found plenty of grilled mackerel at the markets in Berlin. This was at the Volkspark. Pork schnitzel. 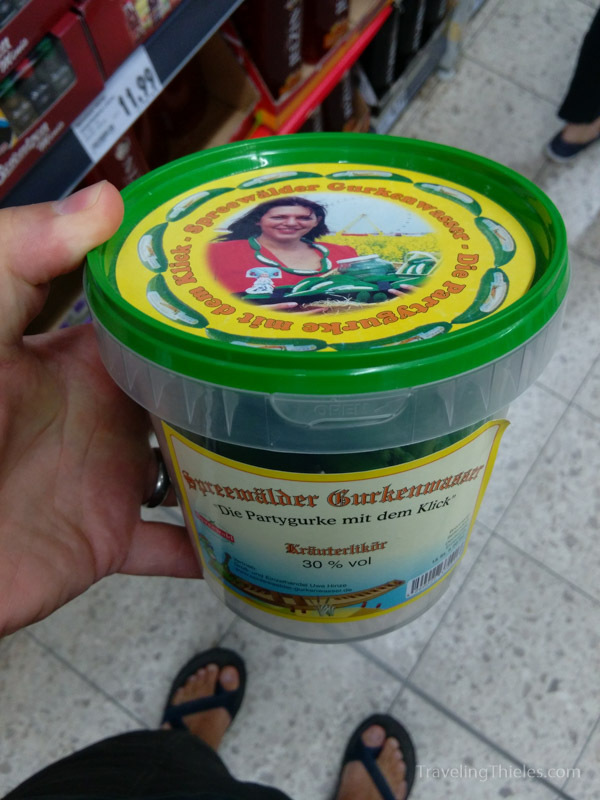 Not as tasty as the veal but still uniquely German. 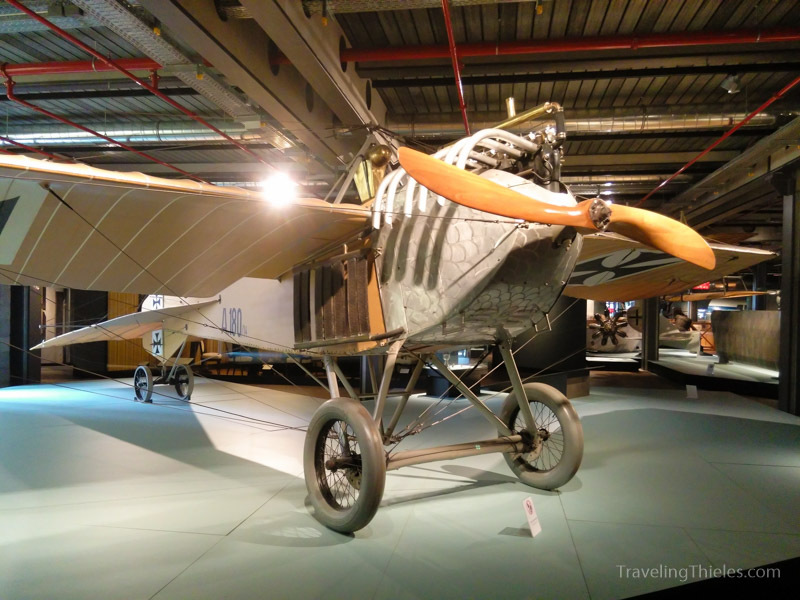 The Deutsches Technikmuseum is a mandatory stop for any gearhead or kid at heart. Mayne loved the impressive collection of old planes.. 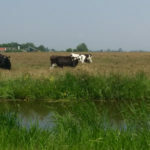 The city is crossed with commuter train lines and has excellent transportation options. This area heading into the main train station, what with all the tracks and the abundance of greenery, is reminiscent of the model train layout of an over-zealous train enthusiast. 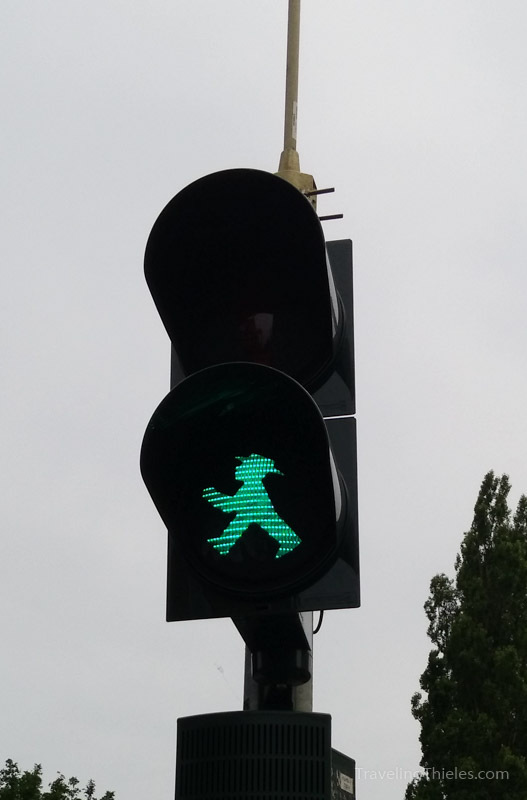 The little gentleman on the crossing signs in the former east German side of the city has become an icon of the city as a surviving relic after the fall of the iron curtain. 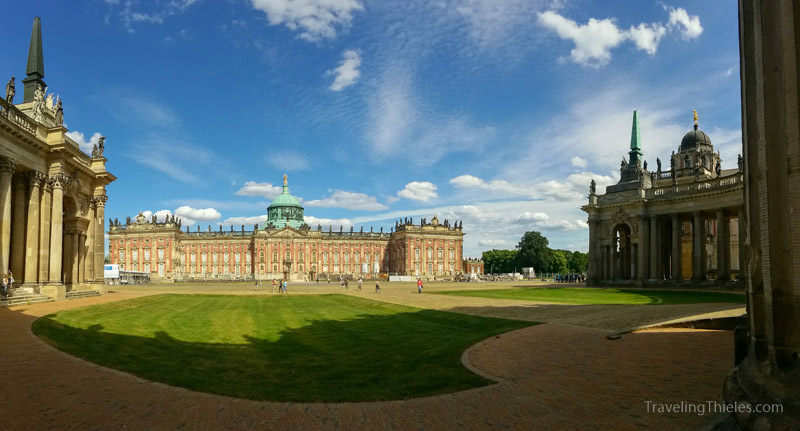 We took a daytrip to Potsdam which is where the Prussian kings and German Kaiser had their homes until as recent as 1918. The city has many pretty lakes and grandiose architecture. 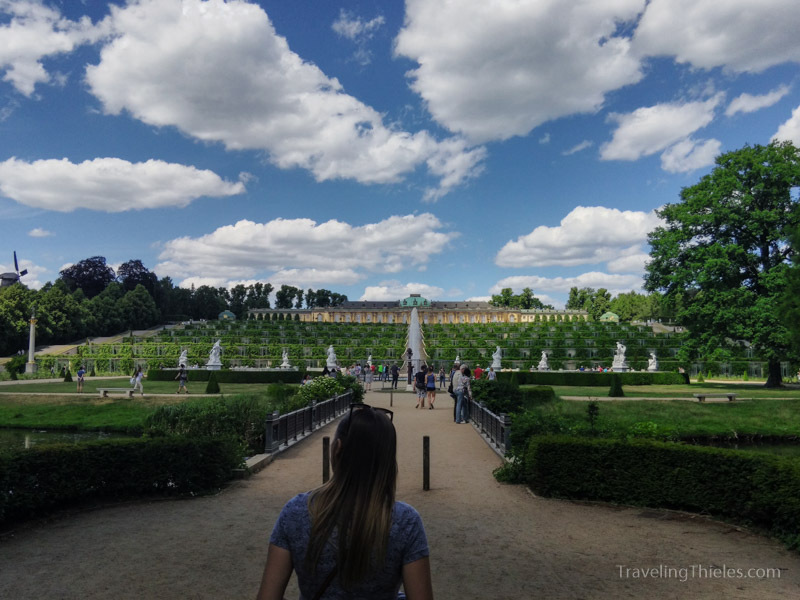 The tiered gardens leading up to Schloss Sanssouci are massive. 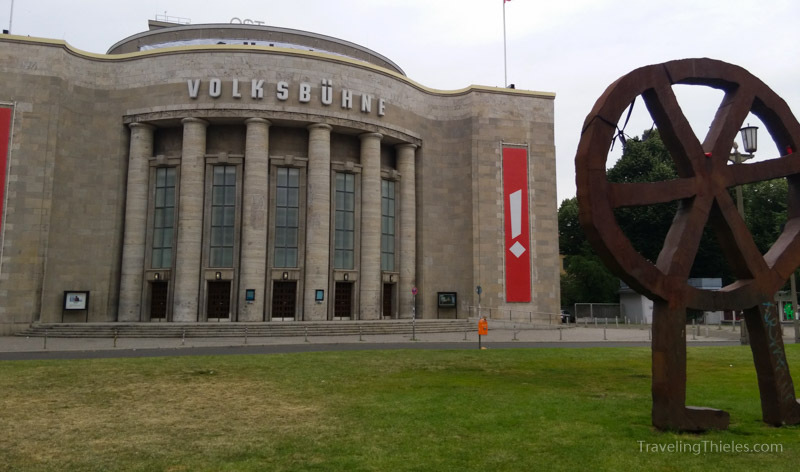 The Volksbuhne or “people’s theatre” in the Mitte district of Berlin has a very stoic appearance. It was severely damaged during the war and has lots of bullet holes and other blemishes all over. 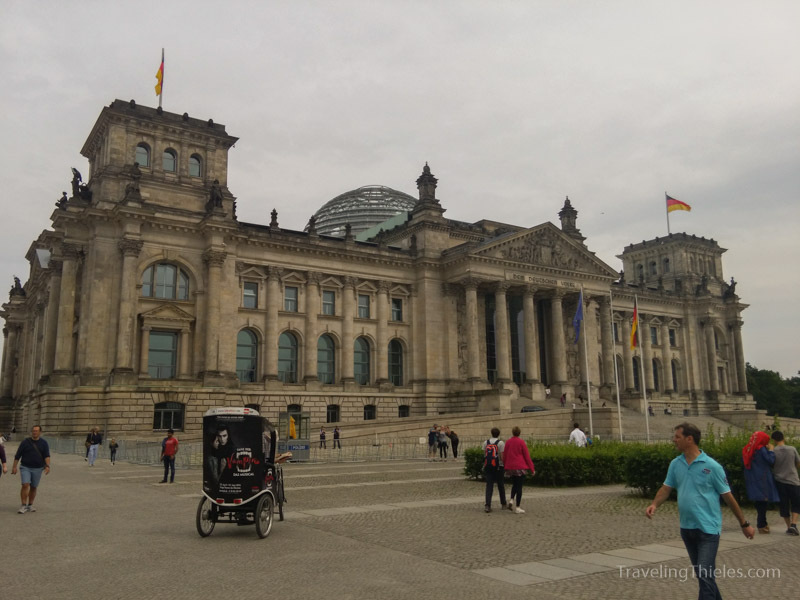 The Reichstag building is where German parliament meets. We loved our long visit in Europe but were also ready to come back home and see the pups. 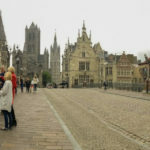 It was a full five weeks of travel – a week in each of five cities – so we had plenty of time to explore, get a feel for each destination and also spare time for when bad weather came around. 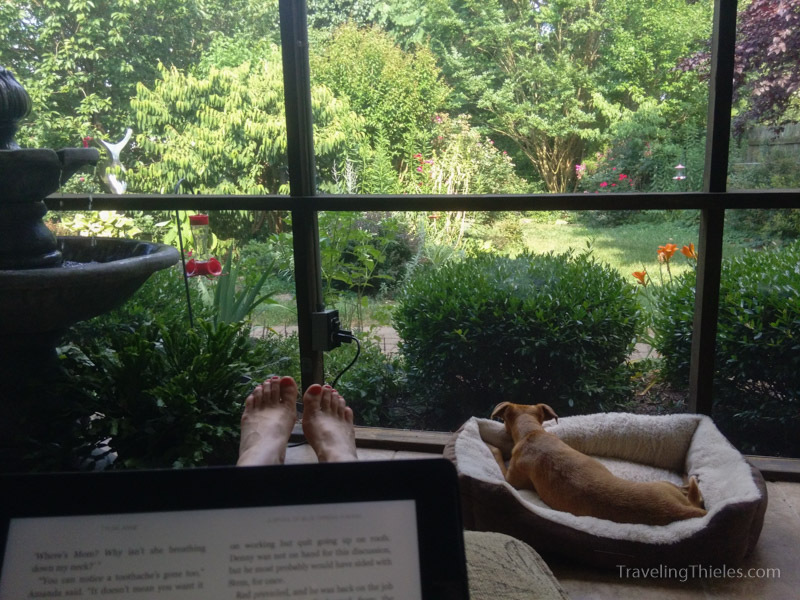 It’s so tempting in Europe to try to squeeze in as much as possible, so having the time to linger was a real luxury. Next time however we will probably shorten our stay in each place and add in at least another destination or two. 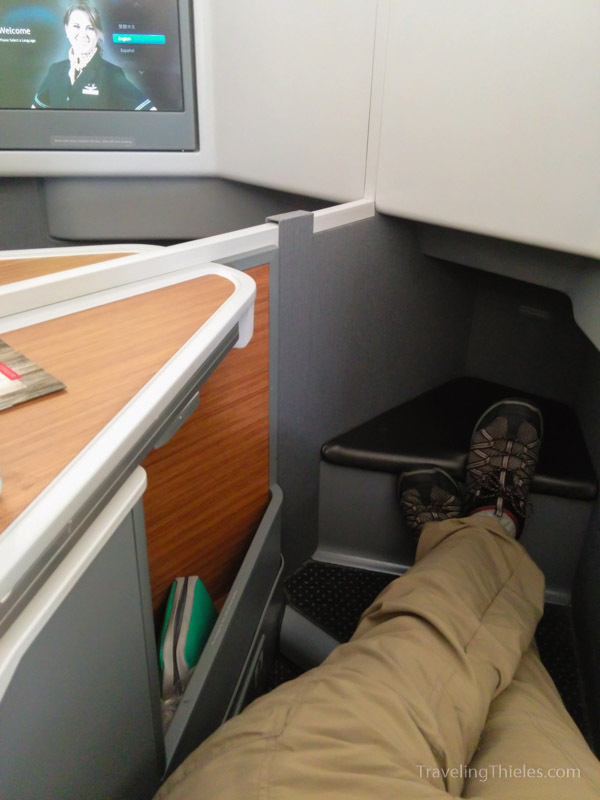 We cashed in American points and flew business class back home. The fully flat seats and many luxuries like concierge lounge access, Bose headphones, open snack bar and personalized attention were definitely nice. 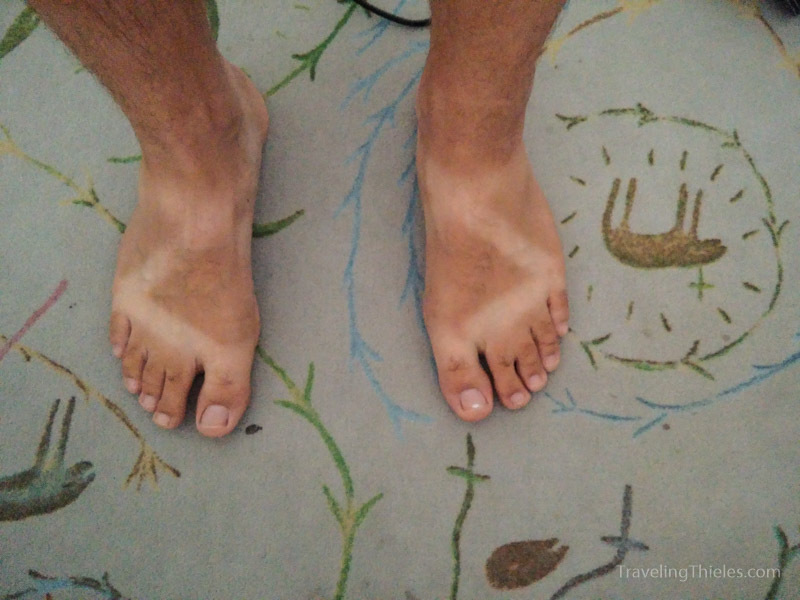 Mayne got a pretty gnarly sandal tan on the trip! We found Nick and Nora quite content after their stay at Mamie and Papa Jims! 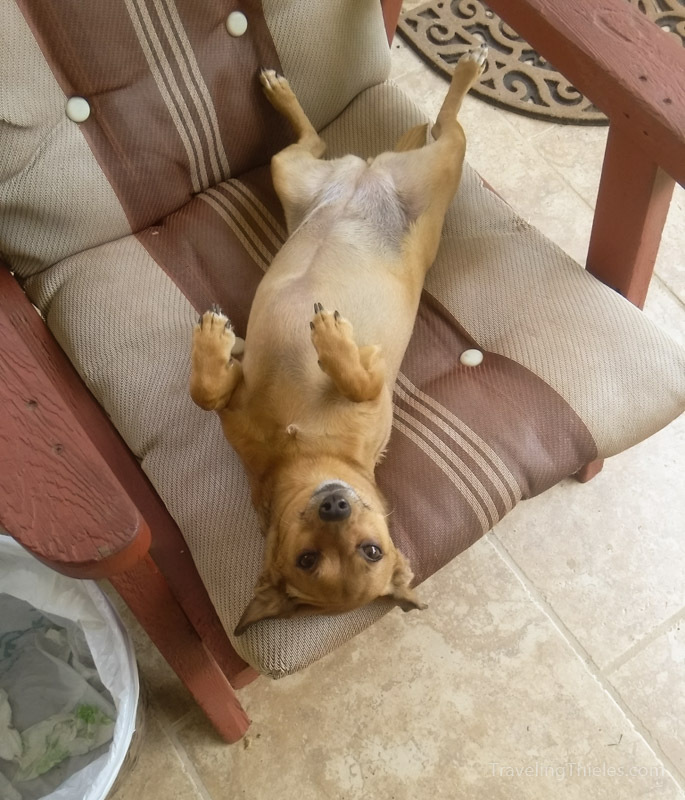 Nora didn’t seem to have a care in the world and was happily plump from her treats! This is Nick’s favorite spot in the whole world – keeping an eye on the local squirrel population in the backyard while lounging on the deck. 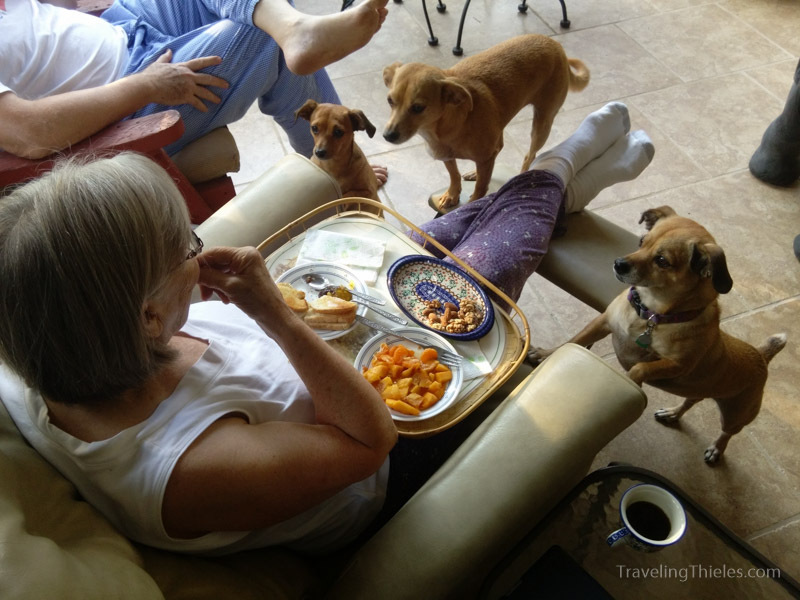 Mamie has all the dogs on a schedule which includes treats handed out individually with her morning coffee. The pups are in good hands in Knoxville! 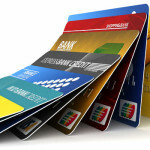 Winter Travel Credit Card Apps and Other Recent Travel Hacking Success! We feel like we have been to Berlin. Love all the pics.